Your child will LOVE this spiderman bounce house themed after the popular comic book. Every single one of your guests will jump and bounce for hours. This beautiful Spiderman bounce house can be one of the high points of your party, being one of the favorite avengers makes a Spiderman bouncy house one of the most popular bounce house rentals. 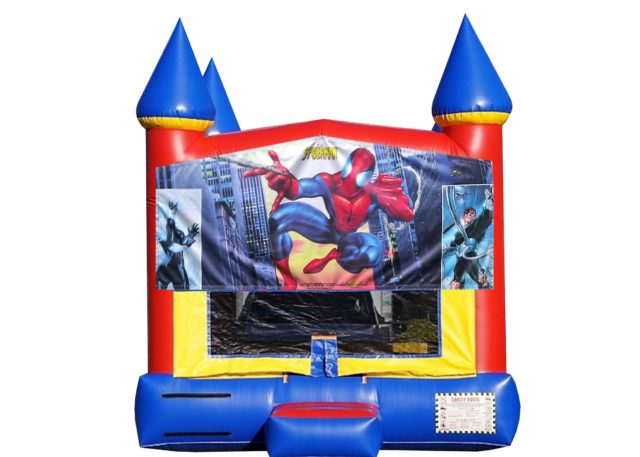 Obstacle courses, inflatable slides and interactive games are also in our inventory, in case that you need to entertain a lot of kids in your Spiderman party.